Approximately three and one-half years ago I wrote a brief report regarding a firefight between troops of the Lebanese Army and Israeli Defense Forces on February 8, 2007. That was a reminder of a similar firefight between the Lebanese Army and the IDF which preceded the surprise war which followed that became known as the Hezbollah-Israel summer war of 2006. A review of that article might be prudent given the breaking news events of just the past 24-36 hours in the Middle East powder keg. It would appear that once again the Middle East is on the brink of war – a war which has been repeatedly forecast to occur; a war the enemies of a negotiated settlement appear determined to cause at all costs. Yesterday another deliberate assault upon IDF soldiers was executed by Lebanese soldiers. In the unprovoked opening skirmish a sniper firing from Lebanese soil shot and killed IDF Reserve Lieutenant Colonel Dov Harari and may have fatally wounded Captain Ezer Lakiya. Israel National News has details on this deliberate Lebanese Army assault. 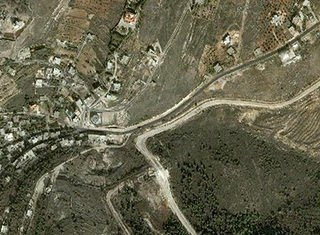 The immediate area of the Lebanese Army sniper assault is seen in the IDF image above. Israel immediately retaliated and the fighting escalated to near open warfare. By no means has this military engagement ended, both sides stand on the brink of full-scale war. The fecklessness of the Western-imposed UNSCR 1701 lies burnt to a crisp, although its remains continue to be propped up like some international scarecrow by malignant global politicians and their toadies. This morning comes word from many Western and Middle Eastern news organizations of an apparently unsuccessful improvised explosive device (IED) assassination attempt against Iranian President Mahmoud Ahmadi-Nejad as his vehicle and security convoy drove through the streets of Hamadan, Iran. After first denying such an assassination attempt has occurred, I hold little doubt that the Ayatollah’s sock-puppet and holocaust-denying president will blame the attempt on “the Zionist entity” further inflaming the military situation in the Levant and the entire Middle East region. This past spring a regional war had been forecast to occur late this summer by many observers in the Middle East. It would appear that once again multiple fuses have been lit to preempt direct negotiations between the Palestinian Authority and Israel, and any of which could ignite the forecast war. Our summer vacation has just been cut short.